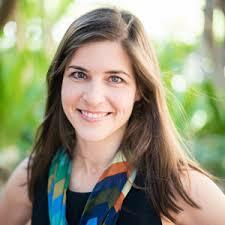 What I love about Gloria Furman is her clear writing and her confident commitment to the Word. A cross-cultural pastor's wife and mother of four, Gloria gets life. And she happily invites her readers to do life alongside her. My heart resonates with hers, and my own experiences often echo the personal stories she shares. 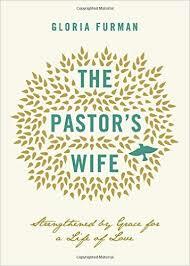 Most recently, I read her book The Pastor's Wife: Strengthened by Grace for a Life of Love. Now I know that I am not formally the wife of a vocational minister. At the same time, I do anticipate a day when Alan will step into that calling, and I sense a need in my own spirit to be prepared for that day. Even right now, though, I sense the need to be "strengthened by grace for a life of love." As a husband and father, Alan is a shepherd, even if primarily to his own little flock: me and the kids. And largely, I believe, the title of this book could put the word pastor's in parentheses, for though it certainly has some applications specific to those whose husbands serve as a pastor in a church, it has so many more applications that are helpful to all of us who stand alongside a man as his wife. This book is broken into three parts: Loving the Chief Shepherd, Loving an Under-Shepherd, and Loving the Bride of Christ. And each of these, depending on how you define under-shepherd, applies to each of us. * "Whenever we speak of our identity as being a woman, a wife, or a pastor's wife, let us have in our minds the primary reference point of being 'found in him' (Phil. 3:9). Every hat we wear or role we play must be viewed through this perspective" (28). * "When you hear of the expectations that others have of you, you are free to consider them in light of God's truth. ... There is no need for defensiveness, fear, anxiety, or insecurity but only for gracious rest because of our security in Christ" (31-32). * And I read this portion after having been called out of a morning worship service for an unruly toddler: "Would it still be 'well with my soul' if we let the church leaders know that we need their prayer and support, for whatever reason? Do you need to enjoy the approval of the leaders in your church in order to enjoy life? Do you feel burdened to represent your husband and family as a public relations manager would? ... Isn't it a grace to us, then, when we are passed over for whatever reason, and when our opinion is ignored or marginalized in that women's ministry meeting, and when our child throws a fit in the middle of Communion?" (47). * "Amid all the expectations that come from others (and from yourself), expect that God's grace will always be sufficient for you all (2 Cor. 12:9). ... Grace carries us all the way through" (51, 54). Under "Loving an Under-Shepherd," we learn the definition and joy of being a "helper" and are reminded that God Himself is our Helper. * "In the midst of all the requests and pressures, there is but one man whom we are called to serve and serve alongside, and there is one God-man who serves us all" (75). * Each family has unique needs that require specific help and support, and by God's grace he gives us everything we need to facilitate this help" (78). Finally, under "Loving the Bride of Christ," Gloria discusses the doctrine of the Church and urges us to "enjoy the privilege of being part of a gathered people" (118). * "We need God's grace to steward our gifts and opportunities well" (123). * "Our weaknesses are not in the way" (135ff) because "our potential to minister to others is not measured by our gifts but by our God" (138). The Pastor's Wife by Gloria Furman is a thoughtful working through for all of us. Maybe in their next round of publishing, they'll go ahead and artfully put parenthesis so that the title reads The (Pastor's) Wife. It certainly deserves wider readership than its current title invites. And as for those parts that do specifically apply to those married to a vocational pastor, they're good for the rest of us to read and understand and make sure we, like the women in Gloria's church, "support [our pastor's wife's] efforts to be a learner alongside [us]" (92), that we pray for her, include her, and love her well as our sister in Christ. An earlier book, and one I read this summer, is a composite work edited by Gloria Furman and Kathleen B. Nielson of The Gospel Coalition. 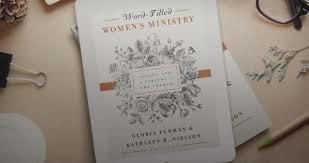 It is Word-Filled Women's Ministry: Loving and Serving the Church. And again, this book is not just for those engaged in leadership of women's ministry, but for all of us women ministering side by side for the sake of the Gospel. One of the treats of this book is getting to read the collective work of various women who are serving our Lord in a vast array of ministries all around the globe. Contributing authors include Keri Folmar, Kristi Anyabwile, Nancy Guthrie, and Gloria Furman. My biggest take away was the importance of the Word energizing us individually as well as energizing our interactions with other women. "The foundational truth [is] that the Bible is God speaking to us" (21). As editor and contributing author, Kathleen Nielson frequently returned to Isaiah 55:10,11, to exhort us to see "the Scriptures as central" (20). "This picture shows us something originating from far outside ourselves--like precipitation from the skky, something we desperately need but don't have in ourselves--so that we're called not to look / inward to receive it but to look outward, to look up and hold out our hands" (21-22). I loved Carrie Sandom's chapter "The Word Passed On" where she writes: "Yes, the gospel needs to be proclaimed to unbelievers, but we also need continually to teach it to ourselves, that we might be fully established in our faith and rooted in the Lord Jesus Christ" (75). Her teaching through 1 Thessalonians 2:1-12 was especially helpful to me. 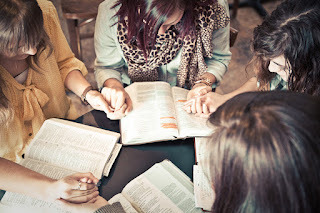 And her perspective on the importance of in-depth biblical training, that "no biblical training is wasted in God's economy" and that it is both a "delight" and a "necessity ... so that one generation will with full voice keep declaring God's grace in Jesus Christ to the next" (86), was really an encouragement. I very much appreciated Cindy Cochrum's insight that "creating a balanced and beautiful local church community grows out of our shared commitment to God's Word and to one another" (102). In Gloria's chapter, she shares her personal testimony in which a Bible study was pivotal to her coming to saving faith in Christ (114, 131). But she also points out that Bible study is needed by all of us, not just those who need to meet Christ but also by those of us who would be healthy ambassadors for him. In her conclusion of this chapter, she writes something that has stuck with me: "As far as we are able, we must take God's Word as seriously as it takes itself" (132). I could point out more, but let me just conclude with the passage that Nancy Guthrie concludes the entire book with: "It is my prayer that your love may abound more and more, with knowledge and all discernment, so that you may approve what is excellent, and so be pure and blameless for the day of Christ, filled with the fruit of righteousness that comes through Jesus Christ, to the glory and praise of God (Phil. 1:9-11)" (244). The more-and-more growth of the Christian life hangs largely on our intimacy with the Word of Truth. To Gloria and to each of these other contributing authors, THANK YOU for your heart for women and for your consistent investment in developing resources that encourage us to put our confidence in the Word and to then compassionately live out that Word in our everyday lives. Readers, I hope you'll take advantage of these two resources. And more, I pray that you will commit yourself to continually learning the Word and living it out in your own home and in your community. May "the Word of the Lord run swiftly and be triumphantly celebrated and glorified" (2 Thessalonians 3:1 AMP). Amen.